A dinosaur gets his veggies. One of my favorite movies as a kid was this 1960 popcorn movie based on the adventure novel by Sir Arthur Conan Doyle. A recent viewing (it's available on Amazon Prime) revealed that The Lost World is less enthralling to the adult me. While that was a somewhat disappointing revelation, I stand by my youthful memories to the extent that I can see its appeal to younger audiences. Plus, it's still a lively affair with a good cast and some nice special effects. As with similar fantasy adventures (e.g., Journey to the Center of the Earth), the first third of the plot is devoted to preparing for the expedition. This particular trek leads to a plateau in the Amazon where dinosaurs still roam. The intrepid explorers consist of: Professor Challenger (Claude Rains); a skeptical fellow scientist (Richard Haydn); big game hunter Lord John Roxton (Michael Rennie); journalist Ed Malone (David Hedison); a helicopter pilot (Fernando Lamas); and socialite Jennifer Holmes (Jill St. John) and her Poodle Frosty. (There's also an expendable, greedy guide and Jennifer's brother). Shortly after the group's landing on the plateau, their helicopter is destroyed by a clumsy dinosaur. Still, getting back to civilization isn't the worst of their problems. There are also giant spiders, cannibals, a volcano on the verge of erupting, a revenge subplot, and the ominously-named "Cave of Fire" (think thin ledges and molten lava). David Hedison and a pesky dino in the Cave of Fire. 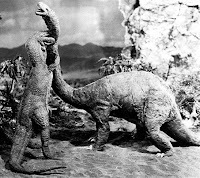 As with 20th Century-Fox's superior Journey to the Center of the Earth (1959), live lizards are substituted for the dinosaurs. Naturally, these creatures can never capture the magic of the imaginative stop-motion creatures created by Willis O'Brien and Ray Harryhausen in, respectively, King Kong (1933) and The Valley of Gwangi (1969). Still, the special effects, courtesy of Fox's resident expert L.B. Abbott, look convincing enough. Jill St. John and Hedison. It's the humans that keep The Lost World from being a better movie. Jill St. John is saddled with a silly character that wears pink pants, a pink belt, and pink boots...in the jungle. Even worse, she personifies the extraneous female added to an action movie simply to broaden its appeal. One can understand Challenger's frustrations with her, but his snippy remarks make him sound like a chauvinist pig. Michael Rennie and Fernando Lamas do what they can with their underwritten parts, while David Hedison comes off best as the film's de facto hero. A scene from the 1925 version. According to some sources, Willis O'Brien sketched out sequences for The Lost World, which were never used due to budget constraints. Thirty-five years earlier, O'Brien did the special effects for a silent adaptation of Doyle's novel. 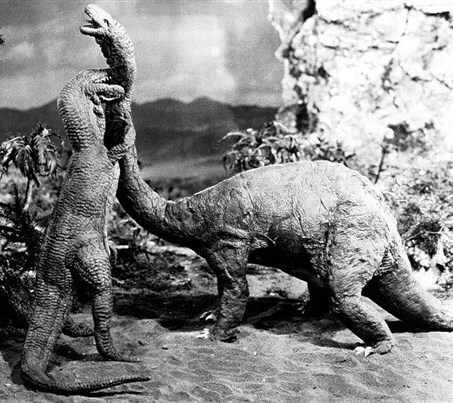 Its climax featured a Brontosaurus destroying London--an undoubtedly expensive scene which doesn't appear in the 1960 version. Doyle's book has served as the basis for several subsequent movies. A 1999 made-for-TV film doubled as the pilot for an Australian TV series based on The Lost World. The resulting series strayed mightily from the book, but retained the characters and was quite entertaining in its own way. Yep. Definitely must be watched through the eyes of our inner kid. Fortunately (? ), for me that's not usually a problem. I like The Lost World mainly for its whole adventure "look" ( I miss the lost-island-with-creatures genre ), but you're right, it doesn't entertain like Journey to the Center of the Earth or some of the Ray Harryhausen films. Earlier this year I saw Island at the Top of the World ( Disney's entry in the genre ) and even though that was catered to children I found it really entertaining. The Movies! channel has been the playing The Lost World often on TV, so if your readers want to check it out, just look at the upcoming airings. I never could do the "lizard in a costume" thing, even as a kid, but Prof Challenger is a character that needs exposure, even if in meager fare such as this. You were much kinder in your review than I would have been, although I did like Jill St. John's pink pants. "The Sky's on Fire" was the Voyage second season episode recycled from the theatrical film. Allen also took the helicopter chase from the Voyage pilot, "Eleven Days to Zero," and reused it in the second season show, "The X-Factor," but with a different outcome. He sure liked to save a buck. It is fun to revisit films we liked as youths even if that initial excitement is gone. Conan Doyle did tell great story and I enjoyed the Aussie TV series as well.